Shefford Town & Campton now head the Premier Division supported by Sportsform following their 3-1 home win over Wootton Blue Cross on Saturday. Lewis Taylor scored twice and Andrew Hayday once against a lone reply from Scott Harvey. Whilst now in second spot are AFC Kempston Town & Bedford College who chalked up their third win on the bounce with a 6-1 victory at Kempston Rovers Development. Delroy Phillips with a brace was joined on the scoresheet by Dan Green, Michael Stephenson, Courtney Boughton and Colby Smith against a lone Rovers reply via Harlem Sambu. Elsewhere, Cranfield United netted their first win of the season with a 2-1 victory at Stevington, Martin Holland grabbing both goals against a home reply via Ben Walsh. The result of the round went to Flitwick Town who ran out 4-1 home winners over UCL side Potton United. Ollie Banfield with a brace was joined on the scoresheet by Josh Reynolds and Will Scutt. Joining Town in the hat for the round two draw will be Wilstead and Sharnbrook. Wilstead received a walkover due to Ampthill Town Reserves withdrawing from the competition and Sharnbrook, after two goals from Jim Burnside, managed a 2-0 home win over Renhold United. 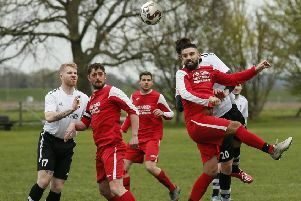 Five other Bedfordshire County League sides were to fall at the first hurdle. Caldecote were leading 2-0 at Ampthill Town after an hour with two goals from Adam Legate and the hosts were also down to 10 men. However they staged a late fightback to win 3-2. Whilst Ickwell & Old Warden had only goals from Lee Threadgold and Ashley Drummond to show for their 5-2 defeat at The 61FC Luton. Sandy found a brace of goals from Jonnie Stratford was not enough to prevent them losing 4-2 at home to Biggleswade FC. AFC Oakley M&DH were beaten 1-0 at Bedford FC and Marston Shelton Rovers 7-0 at Totternhoe. Crawley Green Reserves’ lead at the head of the Division One supported by Wests Citroen is now down to goal difference after they were held to a 1-1 draw at M&DH Clapham Sports. Sam Maddix netted for the home side and Calum Yates for the Green. Whilst for second place Meltis Albion it was a 3-1 home victory over Shefford Town & Campton Reserves. Dan Smith, Craig Damon and Alexis Kamenan all found the back of the net against a lone Town reply from Simon Castle. Now in third spot are Westoning who made it three wins on the bounce when running out 4-3 home winners over bottom of the table Cople & Bedford SA. Thomas Cooksley with a brace was joined on the scoresheet by Rob Cooksley and Lewis Wilson against SA replies via Ollie Hughes, Daniel Collins and Ashlee Banton. Elsewhere, Queens Park Crescents maintained their unbeaten record to climb into fourth with a 6-3 home win over second from bottom Old Bradwell United Reserves. Ayaz Hussain led the way with a hat-trick, Daniel Rasol with a brace and a single strike from Shazad Sattar marking the home scoresheet against United replies via a penalty from Andy Sherratt plus strikes from Barry Rooney and Micah Jackson. Missing the chance to climb into the top three were Henlow who, before a Ground Hop crowd of 128, were held 3-3 at home by Ickleford. Luke Hills fired them ahead in the 11th minute before in the last action of the opening half Paul Wright made it 2-0. The visitors, via Nico Miceli, pulled a goal back just three minutes in the second period but within two minutes Adam Walker had restored the home side’s two goal advantage to make it 3-1. That’s the way it stay until the 73rd minute when Jacob Bussue struck for the visitors to make it 3-2 and set up a possible grandstand finish. That saw Richard Follano level matters seven minutes from time and then his brother Gabriel receive his second yellow card and the lonely walk back to the dressing rooms, but the visitors held firm until the final whistle some five minutes later to earn themselves a point. Now in sixth are Totternhoe Reserves who retained their unbeaten record when winning 3-2 at AFC Kempston Town & Bedford College Reserves. Jonny Clarke scored all three goals against home replies via Giovanni Moscaritoio and Kegan Roberts. Also enjoying life on the road were The 61FC Luton Reserves who claimed their first win of the season 4-3 at Elstow Abbey who were duly defeated for the first time this season. Lee Garner, Faycal Yattara, Abdullah Ahmed and Pat Doherty were on the winners scoresheet against a Lucas Banton hat-trick in reply for the Abbey. Ground Hop game number two of the day before a crowd of 93 was to bring about the shock result of the afternoon with hosts Kempston Hammers Sports running out 2-0 home winners over league leaders Wixams. Jimmy Grandidge proved to be the sole destroyer with goals in the 15th and 67th minute of the contest to gain revenge for the Hammers’ opening day 8-0 defeat on the 3G at Wixams. Now in second are Atletico Europa who ran out 2-1 home winners over Houghton Athletic, Kane Alexander and Mo Banda netting the vital goals against a lone reply via Troy Walker. Losing out on that second spot were Lea Sports PSG who were held to a 1-1 draw at Sundon Park Rovers and now occupy third place, Joe Hennam netting for PSG and Jordan Holmes for the Rovers. Whilst up into fourth place are Riseley Sports the 4-3 winners at Potton Town. Josh Poole, Jack Healy, Jake Hislop plus an own goal marked their scoresheet against Town replies via James Pyman twice and Tom Pyman once. Also enjoying life on the road to chalk up their first win of the season were AFC Oakley M&DH Reserves with a 4-2 victory over Caldecote Reserves. Kieran Langley with a brace plus strikes from Kade Walker and Dan Glos seeing their goals only replied to by Sean Bent and Jake Bruce for the home side. Whilst Cranfield United Reserves maintained their seasons 100% home record with a 3-2 win over Flitwick Town Reserves thanks to goals from Callum Riches, Jack Sharman-Dodd and Daniel McLaren. Kempston Athletic now find themselves three points clear after winning 6-2 at Shefford Town & Campton A. Josh St Clair Pierre with a brace joined on the scoresheet by Gary Whitbread, Danny Bibby, Luke Mongiovi and James Maxwell against two in reply from Town’s Tristan Potkins. Now in second are Wilstead Reserves who won 2-0 at Sandy Albion thanks to goals from Liam Philps and Luke Pursey. Whilst dropping down into third place are Marston Shelton Rovers Reserves who were beaten 1-0 at home by a Renhold United Reserves side winning for the first time this season thanks to a strike from Michael France. Up into third spot are Bedford Albion who maintained their 100% record with a 5-1 victory at Caldecote A. Dan Jeffries with a hat-trick plus an own goal and a strike from Simon Wade bringing up the nap hand against a lone home reply via Joe Rowley. Elsewhere, the 5th Annual League Ground Hop Day came to an end at Wootton Village when before a crowd of 131 the hosts shared the spoils in a 2-2 draw with White Eagles. Adam Flynn put the Village ahead in the 49th minute only to see Rafae Cygan level matters just six minutes later but when Jason Churchman-Hall headed the Village back in front 11 minutes from time they looked set for their first win of the season. Alas for the Village the Eagles were still flying and with just four minutes left Marcin Ptak levelled matters at 2-2 to give them the point that would take them up into sixth place in the table and leave their hosts on the bottom of the standings and now the only side in the division without a win this season. CS Rovers’ lead at the head of the division four league table is now up to four points after they won 3-2 at AFC Kempston Town & Bedford College A. Tom Taylor netted twice and Ruairl Griffin once against home replies via Niko Stanchev and Chris Allan. Whilst for second place Dinamo Flitwick it was just a share of the spoils after being held to a 3-3 home draw by Henlow Reserves. Dale Goldie netting twice and Rhys Hughes once against Henlow replies via an own goal plus strikes from Sam Crow and Ross Irving. There was also a sharing of the points for third place Harlington who were held to a 4-4 home draw by Sandy Reserves. Ryan Martin with a brace plus goals from Sikdar Subahan and Joe Cullen marking the home scoresheet against Sandy replies via Liam Brophy twice plus Aidan London and John Joe Pekszyc. Elsewhere, there were first wins of the season for Flitwick Town A and Stevington Reserves. Town were 4-1 winners at Clifton where Mitch Walker with a brace was joined on the scoresheet by Jamie Dimery and Dan Parker against a lone reply from Gavin Stackeman. Stevington, with two goals from Aaron Fletcher and one from Cameron Cain, were 3-2 home winners over Lidlington United Sports whose replies came via Alex Roberts and John Webber.